The palatial building built on an area of 330 acres with a private garden designed by the illustrious Lutyens, as the official residence of the Viceroy of India during British reign, is now the official residence of the First Citizen of India - its President. The imposing structure almost overshadows all other monuments within its vicinity. The architectural wonder is a mixture of Mughal and Western styles. The columns at the front entrance have bells carved into them and Lutyens designed them with the idea that since the bells could not make sounds, the British rule would never come to an end. Rashtrapati Bhawan is the highlight of Lutyens New Delhi and was completed in 1929 at a cost of 12,53,000. The palace has 340 rooms. At one time, 2,000 people were required to look after the building and serve the Viceroy's household. It has an impressive garden called the Mughal Gardens, which is open to the public for a short while in February when the flowers are in full bloom. The Delhi Rashtrapati Bhawan is a well-known monument of British Empire which is said to be the palace of the Viceroy of India. Delhi Rashtrapati Bhawan is measured to be the best known monument of India next to wonderful Taj Mahal and Qutub Minar. Rashtrapati Bhawan of Delhi is the house of the President of India. It is a real masterwork that was built in the British period. 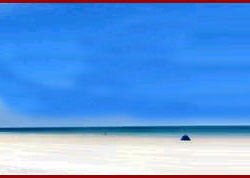 It is the focal point of New Delhi and located in the Raisina Hills. The total cost of constructing the Rashtrapati Bhawan of New Delhi crossed �12, 53, 000 in British India. There is a Durbar Hall inside the Rashtrapati Bhawan in Delhi and the auditorium of the hall measures 22.8 meters in diameter. The hall is manifest by the beautiful colored marbles. You can see the Viceroy's throne in this hall. The Arjuna Awards for brilliance is also presented in this hall of the Rashtrapati Bhawan of Delhi. To the west of the Rashtrapati Bhawan of Delhi, there is a wonderful Mughal garden which is open to the public every spring. The parliament street closest to the Rashtrapati Bhawan of Delhi excludes the bus service but you can reach the Rashtrapati Bhawan of Delhi by hired taxi or auto rickshaws. General public cannot enter the Rashtrapati Bhawan of Delhi. Official permits are required to visit the Rashtrapati Bhawan of Delhi. The most remarkable feature of the House that can be spotted even standing a kilometre away, is the huge neo-Buddhist copper dome that rises over a vast colonnaded front. Beneath the dome is the circular Durbar Hall 22.8m in diameter. The coloured marbles used in the hall were brought from all parts of India. The Viceroy's throne, ceremonially placed in this chamber, faced the main entrance and commanded a view along the great axial vista of 'Kingsway', now known as Rajpath. Presently the hall is the venue of all official ceremonies such as the swearing in of the Prime Minister, the Cabinet and the Members of Parliament. It is in this very chamber that the President annually confers the Arjuna Awards for Excellence. The columns at the front entrance have bells carved into their capitals. The principal floor comprises a magnificent series of state apartments. The State Drawing Room is barrel-vaulted and plainly treated with domestic fireplaces. The State Ballroom is enriched with old English mirror glass. The State Library is based on the form of Wren's St Stephen's, Walbrook. The State Dining Room is lined with teak panelling enriched with the star of India. The concept of Imperial order and hierarchy pass through the entire house. Marble staircases flanking the Durbar Hall provide access to the private apartments above. There are 54 bedrooms together with additional accommodation for guests. The Durbar Hall served as a museum for several years till the building that now houses the National Museum was completed. 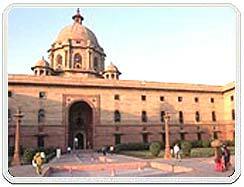 Coming from India Gate, the Parliament is situated on the right of Rashtrapati Bhavan, and the Secretariats on the left. The India Gate lies towards the east of Rajpath. 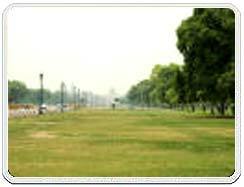 Also known as 'Kingsway', Rajpath is the venue of the Republic day celebrations each year. It is flanked on both sides by ponds and lush green lawns. Vijay Chowk in front of the Rashtrapati Bhavan leads onto Rajpath, which is lit at night and is truly a breathtaking sight with its gardens and fountains.